Canoe Polo, a spectacular and rapidly growing discipline of the International Canoe Federation, is unlike other Canoe sports. Canoe Polo is a game of two halves of 10 minutes where two teams of 5 players battle it out with a water polo ball. The aim is to score into a goal, which is suspended 2meters above the water at each end of a rectangular ‘playing pitch’. These pitches can be on open water or they can even be on a swimming pool. The sport is as much fun to play as it is to watch. The game is played in short stable kayaks on a pitch that is 35m long and 23 m wide. Teams consist of 5 players on the pitch with up to 3 rolling substitutes who sit behind the goals. Canoe Polo is a fast ball sport with the teams objective to score a point by throwing the ball into the oppositions goal which hangs 2m above the water and is 1.5m x 1m in size. Canoe Polo boats are flat stable kayaks that are not dissimilar to a slalom boat with the nose and tail cut off. The only way to maneuver the boat is with the paddle and polo players quickly learn the skills necessary play in this manner. In addition, players must learn the skill required to throw the ball with the speed, skill and accuracy necessary to either score a goal or just to pass to team mates without the ball being intercepted by an opposition players paddle. 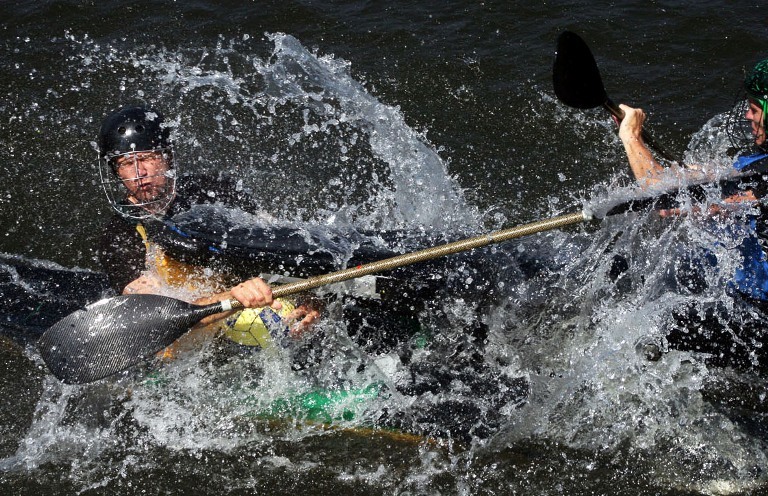 Canoe polo, as with any team sport, requires that players develop tactical play to outwit their opponents. In general, when a team loses possession of the ball the players will chase back to their goal, set a goalie in place, and form a zone around the goal area to try to prevent attackers from getting close enough to take a shot. Any player can play goalie with the referees interpreting the goalie as being the closest player to the centre of the goal whilst in defense. Once a ball is thrown at the goal the best defense is for a defending player or the goalie to try to stop or bat the ball away from the goal with their paddle. In attack a team would develop strategies for attacking an opponent’s zone. Canoe Polo is an exciting contact sport and players can use their boat to impact or drive an opposing players boat away whilst in the zone area. Similarly though, a defending player can use their boat to block other players from entering the zone. During attacking plays the team will often use big strong players to try to drive defenders away from an area thus creating a hole into which other attacking players can enter to score. Although Canoe Polo is a contact sport the game has certain rules which are made to prevent players from getting injured. These rules include fouls for illegal use of the paddle and boat. Players are also required to wear a helmet with face mask as a precaution to protect against paddle blows and life jackets which are classed as body armour, protecting against boats. Boats are also padded at the back and front to protect other players in the event of a collision with the body (which is a foul anyway). The above rules and protection have meant that there are very few injuries sustained in canoe polo. Canoe polo is currently played in KwaZulu-Natal (Durban and Pietermaritzurg), Gauteng, Knysna and Cape Town. Canoe Polo is played at a World Championship level and is a sport in the World Games. The World Championships allow for the entry of Senior mens and ladies and U21 mens and ladies teams to the competition. The World Championships are held every two years and the world games every four. South Africa have competed at eight of the nine previous world championship events with a best result of 7th in the senior mens category. Historically the World Games allow only the top six teams in the world and hence South Africa have not had the privilege of playing at one of these events. Canoe Polo is seen as an ideal vehicle for introducing the sport of canoeing to new paddlers. The game is exciting and fun to play and since the boats are quite stable it allows new players to become competitive very quickly.